Gurage music has a particularly unique beat and dance, which is immediately recognisable. It almost sounds like there’s a ‘break’ in it, which can be at half or double speed. 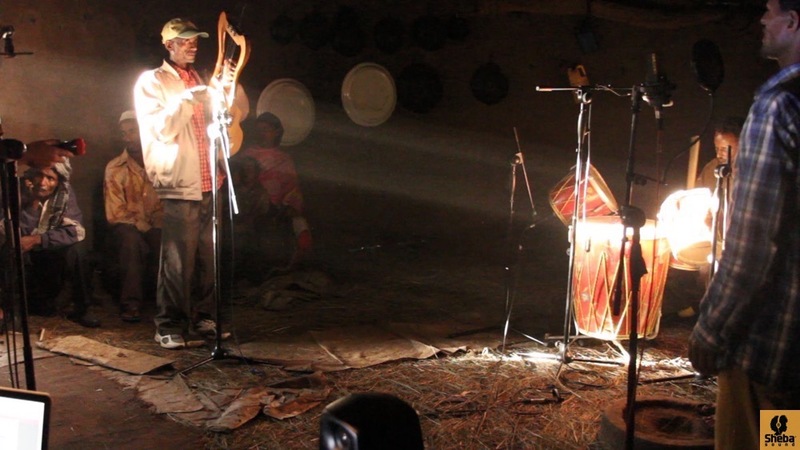 Modern synthesizer-driven songs from this area are regularly played in bars, and you will always hear a Gurage dropped by an acoustic cultural group playing in tourist restaurants in Addis. The modern interpretation of the Gurage style on the synthesizer, which is pretty much all we could find in Addis, suggested that if we travelled to the area, and identified musicians, we would get something amazing that we couldn’t locate in the cosmopolitan capital. On arriving in Welkite, the first thing that became apparent was that we originally had an umbrella concept of Gurage, which actually spanned 7 different tribes, with different interpretations of the same beat. The Sabat Bet (seventh house) Gurage group featured in this recording are Orthodox, whereas there are also Muslim and possibly animist groups as well, each of which have their own take on the Gurage style. The song featured here is called Ebo. For comparison, here’s an older track called Alembrei, which sounds like it was recorded in the early 90s. It’s interesting because it focuses purely on the half beat, or the ‘break’, without ever diving into the double speed that you normally hear in this music. It came off someone’s desktop in Addis – sadly they couldn’t tell us anything about it, and there was no accompanying information with it. Please do get in touch if you are able to tell us any more about this song. This was the track that inspired us to go into the countryside and find out more about Gurage music. Here’s Wose Bassa by Tsegay Sami, a modern Sabat Bet Gurage artist based in Addis, who made this hit tune on a synthesiser. It gets played at the bars all the time. The Dub mixes showcased here were made by UK Dub producer Nick Manasseh, (Tiger Lily) with inspired overdubbing on electric guitar by Corentin Seznec. The funky bass lines were recorded in Addis Abeba, with Dawit Seyoum on bass krar. We’ve given you a half hour extended mix here, as once the groove is locked down with the festivities, the same song can run for hours!